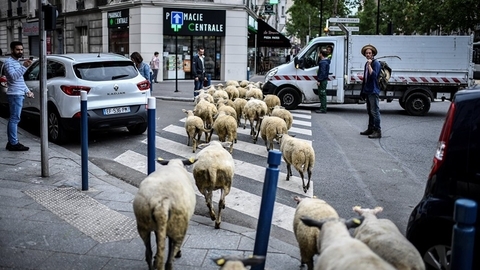 Every month the herders from urban agriculture project in Aubervilliers (commune and the Northern suburbs of Paris) produced dozens of sheep, so they can wander the streets. The goals are different — to give the animals access to new plants, to bring the rural world in the area of the big city. It is believed that it helps people to relax, relieve stress. Sheep peacefully wander past the cafes and gas stations, stop to nibble the grass.